Stylus Publishing (VA), 9781620368053, 189pp. Students who know how to collaborate successfully in the classroom will be better prepared for professional success in a world where we are expected to work well with others. Students learn collaboratively, and acquire the skills needed to organize and complete collaborative work, when they participate in thoughtfully-designed learning activities. Learning to Collaborate, Collaborating to Learn uses the author's Taxonomy of Online Collaboration to illustrate levels of progressively more complex and integrated collaborative activities. - Part I introduces the Taxonomy of Online Collaboration and offers theoretical and research foundations. - Part II focuses on ways to use Taxonomy of Online Collaboration, including, clarifying roles and developing trust, communicating effectively, organizing project tasks and systems. - Part III offers ways to design collaborative learning activities, assignments or projects, and ways to fairly assess participants' performance. 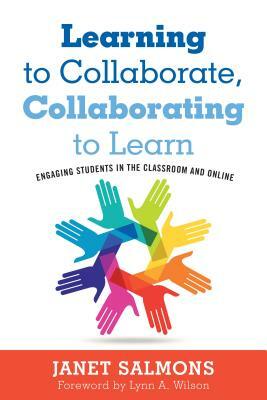 Learning to Collaborate, Collaborating to Learn is a professional guide intended for faculty, curriculum planners, or instructional designers who want to design, teach, facilitate, and assess collaborative learning. The book covers the use of information and communication technology tools by collaborative partners who may or may not be co-located. As such, the book will be appropriate for all-online, blended learning, or conventional classrooms that infuse technology with "flipped" instructional techniques.